Oxidation is the chemical process in which there is a chemical reaction that involves the moving of electrons. To be more precise, it means that the substance that is giving away electrons is oxidized. In simple terms it means that the surface of any object is affected when time goes by. A detailer has the tools and knowledge to remove the very small surface layer that is oxidized, revealing a surface that is near new. This process will not only restore the gloss and shine of the paintwork, it will also remove very small surface imperfections such as swirls, marring and perhaps even holograms, buffer trails and chemical etching. Oxidized paintwork will not look the same as un-affected paintwork. The process starts at the surface. The smooth and glossy surface because less smooth on a microscopic level. The effects of this are tiny in the beginning, as as the oxidation grows, the effects will become more clear. The surface will loose gloss, some forms of protection might last less long, dirt requires more effort to remove and reflections might not looks as clear as they used to do. In the case of single stage paint (uni paint), this is even more evident because the color itself seems to become dull. This type of paint does not have a clear coat, and therefore shows the oxidation directly in the color that is reflected. Paintwork that does have a clear coat will show hardly any difference in color because its only the clear coat that suffers from oxidation. Oxidized paintwork feels rough to the touch. The oxidation on this surface shows it turning matte, but not loosen much of its original color. This would be predominantly oxidized paintwork. Although these is still some gloss left in the pink section, it is clear how it seems to have lost its color. This is predominantly UV damage. 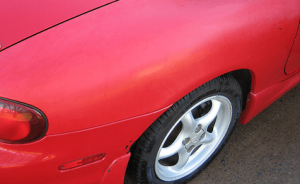 Regarding this subject, there is a lot of confusion between UV damaged paintwork and oxidized paintwork. The first is caused by harmful amounts of UltraViolet light (most likely from the sun), which causes UV damage in the upper surface layer of the paintwork. This can eventually get deeper into the paint and become irreparable. UV damage can be recognized on color fading. A dark blue car will slowly become more light blue. A red car will slowly become pink. The surface might still be glossy, and still feel smooth as glass, but the color itself will fade. The second is caused by oxidation. An oxidized surface will show structural failure in the most extreme cases, but will start out with a rougher surface that slowly turns matte instead of glossy. This matte surface might still have the original depth of color, but will not retain its mirrorlike gloss. Although it is repairable, it is also inevitable. The surface has become more unstable and brittle, meaning it will also fall apart quicker. Using a very rough cutting compound will increase the amount of surface you will cut away, and thus remove more of the surface. Which might not be needed. Removal of the oxidized layer is sufficient and might nog require deep cutting. In fact, several chemical finishing polishes are capable or removing oxidation without removing much of the surface itself. A lot of deep and hard polishing is required for a prolonged time. Due to the unstable surface, the oxidation is likely to come off from the surface underneath without much trouble. This means small amounts of the surface come off more easily then normal. During regular polish you should already take into account the amount of paintwork that is removed, and ends up in your polishing pad. In this case, it will be even more then normal. This means you need to clean your pad more often. Polishing for a prolonged time can cause you to rub around the oxidized paint particles over the rest of the surface, creating surface imperfections. Claying the surface more intensely then normal, can already have a good effect on the amount of oxidation that is removed. Meaning you’ll spent less time polishing and cleaning your polishpad. Due to the softness and brittleness of the surface layer, it is possible then the color of the paintwork is transferred into your polishing pad. Surface without a clear coat, have paint particles that carry the color of the surface in them. As soon as you polish these off, the particles will mix with the oils in your polish. This creates coloration that penetrates your polishing pad. A red car without a clear coat can turn your polishing pad red. 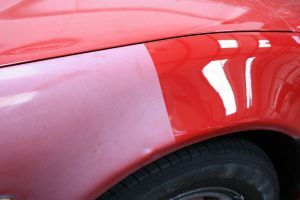 This will happen anyway to some degree on this type of paintwork, but will happen less if there is less oxidation present. Using a cutting compound will also increase the amount of coloration, because you remove more paintwork particles that carry the color. Polishing with a finishing polish should only cause minor coloration of your polishing pad (unless there is a lot of oxidized paint present). 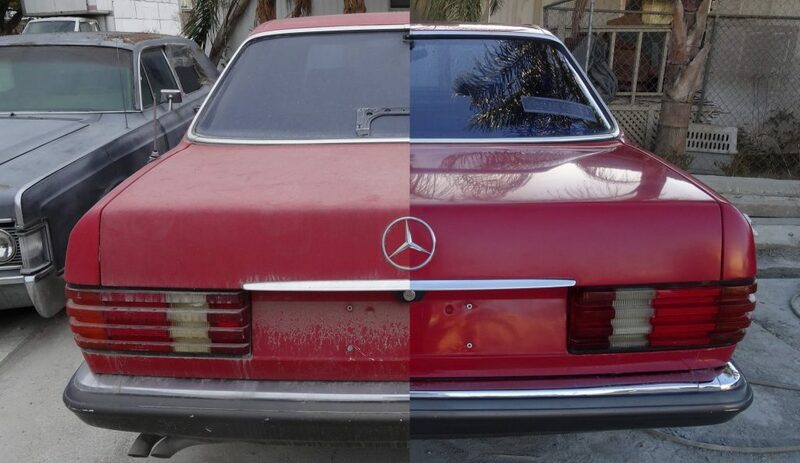 Oxidation does not only affect paintwork. It also affects metals, glass and even plastic to a degree. These surfaces can also suffer greatly from UV damage, but oxidation is also a frequent issue. Just as with the paintwork surface, these surface can often be polished to bring back the original look. Also in this case the oxidation will still be inevitable. It can often be prevented to a degree by using a protective product. However, there is no permanent fix to prevent or repair an oxidized surface.